Last week, Sri Lanka’s finance minister, Ravi Karunanayake, announced that Sri Lanka would sell an 80 percent stake in Hambantota port in the country’s south. The $1.5 billion port project, which has long been the subject of attention by Chinese state-owned firms, will also become a Chinese investment zone. The deals are expected to be finalized in November. “The value will be more than $1 billion and the deal will be signed around the second week of November,” Karunanayake said, speaking to reporters. Under the Sirisena government, Chinese investment projects initiated in Sri Lanka under the Rajapaksa days came under scrutiny. The first phase of Hambantota port was built with Chinese loans and facilitation, but progress on the second phase was temporarily frozen as CHEC came under investigation. That changed earlier this year with Sri Lankan Prime Minister Ranil Wickremsinghe’s visit to China, where he first brought up the idea of an equity swap in a range of infrastructure projects, including Hambantota, against Sri Lanka’s existing debt to China. While the proposal was originally met with skepticism by China, the finance minister’s announcement confirms that Beijing has now come around. For China, Sri Lanka stands as an important node in the Maritime Silk Road, the maritime component of Beijing’s broader One Belt, One Road initiative to improve infrastructure and connectivity across Asia. 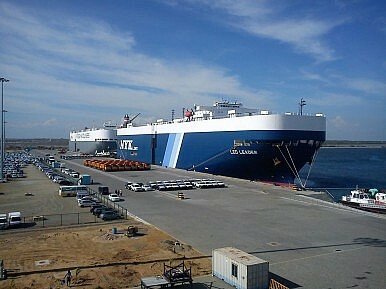 Additionally, given Sri Lanka’s proximity to India and strategic location in the Indian Ocean, Chinese investment in the country has taken on geopolitical relevance, particularly as Chinese naval assets, including warships and submarines, were seen docking in Colombo during Rajapaksa’s final months in office. Sirisena came to office vowing to rebalance Sri Lanka’s foreign policy between India and China, but as Wade Shepard recounted in The Diplomat earlier this summer, increasingly, Colombo has gone back to realizing the necessity of Chinese capital. “They are going back because they’ve woken up to the realities of geopolitics,” one Sri Lankan scholar told Shepard. The upcoming signing of the equity swap and investment zone deals for Hambantota will underline that.